I love the look of these geometric terrariums. 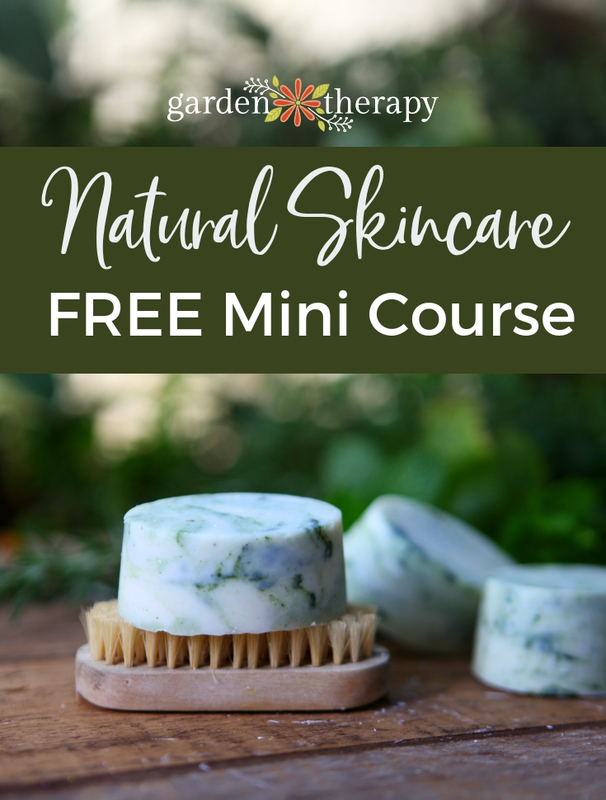 They make me think of nineteenth-century conservatories or vintage apothecaries, yet the geometric shape feels fresh and modern at the same time. With a few small houseplants, some reindeer moss, and a little know how, you can transform simple glass containers into lush, thriving terrariums in no time! Tropical indoor plants like pothos are used as houseplants because they tolerate the lower light and warm, temperate conditions usually present indoors. Tropicals often really love humidity, which is why they are such good candidates for closed-top terrariums or glass bell jars. Soil and plants naturally release water vapor, and when they are inside an enclosed space like a glass terrarium the vapor collects on the roof and sides of the container and creates a humid environment. 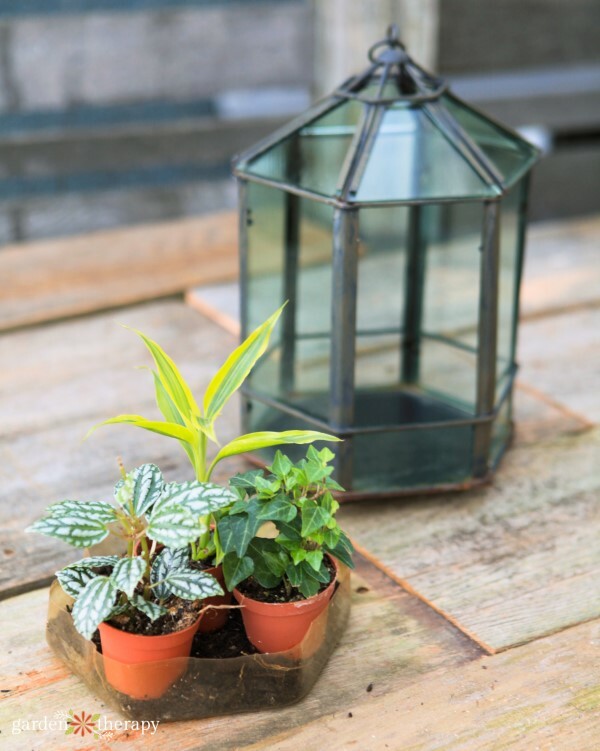 Succulents and cacti are wonderful houseplants as well, but with a terrarium that has a closed lid like these ones, tropicals are the way to go. Even though there is an opening in the front of this geometric terrarium, the covered roof still creates a more humid microclimate perfect for tropicals. If you place cacti and succulents in the same terrarium, they need much brighter light and that will also dramatically increase the temperature inside the glass. 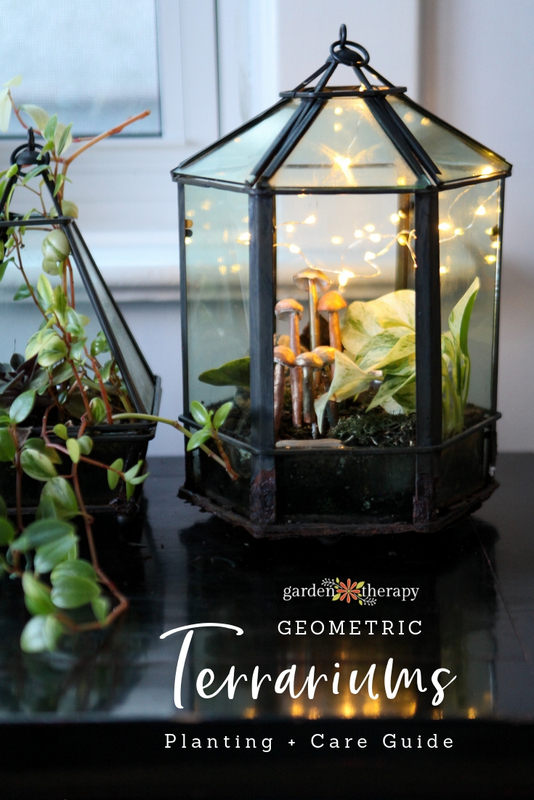 If you want to make a succulent or cactus terrarium, then use an open bowl and save these beautiful geometric terrariums for tropicals to thrive. They will grow and morph over the years and show so much personality! Look for glass containers in interesting geometric shapes. 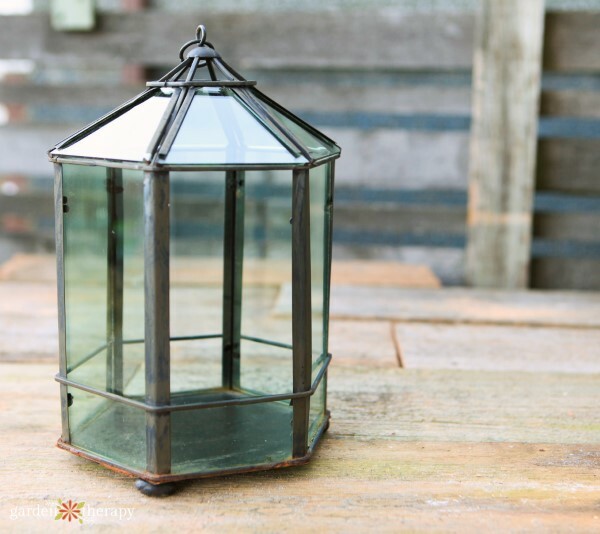 I like the metal detailing on the terrariums I found—it gives the shape a dramatic outline and the slightly weathered look of the finish lends a vintage feel. 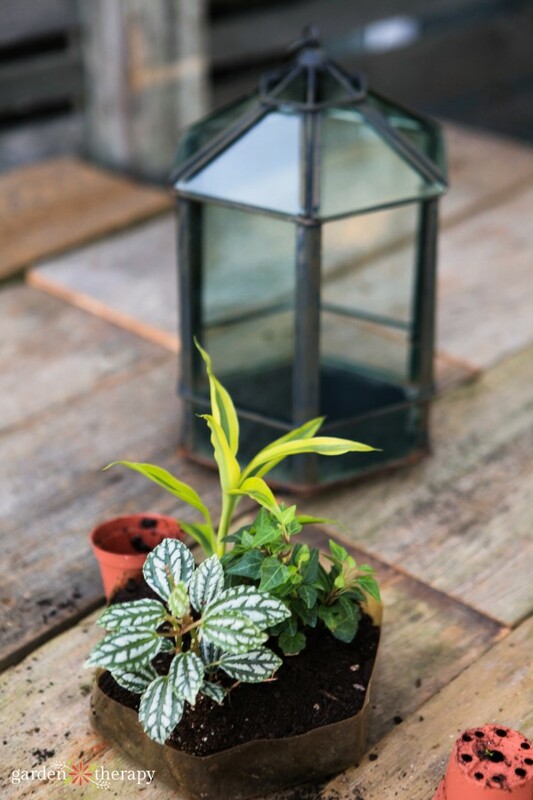 If you can find a terrarium with a plastic liner inside, that is ideal as you can use it to keep the soil and plants in place, but if your container doesn’t have one you can make your own out of a plastic tray from the recycling bin. It won’t look as attractive, but you can easily disguise your makeshift liner with a little strategically placed reindeer moss. Keep in mind that glass terrariums are not going to have holes for drainage. 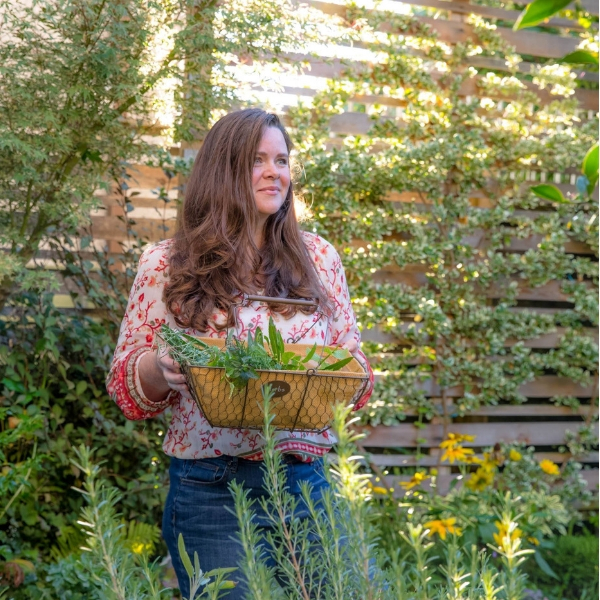 If you are used to caring for houseplants and terrariums and are confident that you will not overwater the plants, don’t worry about the lack of drainage and just be mindful of how often you are watering. However, if you are concerned about overwatering, you can create drainage inside the terrarium by spreading out some pebbles in the bottom of your plastic liner. You could also add charcoal to the soil to help prevent damage caused by overwatering. Charcoal works to absorb and remove odor and toxins produced by pooling water. Before planting in the soil, play with positioning your plants in different configurations to get a pleasing design. Place taller plants in the back and shorter ones in the front so that none of them will be obscured. Try to choose plants with different colors, textures, and shapes to get the most interesting display. If you are going to add drainage pebbles to the bottom of your plastic liner, do that first. Next, fill the plastic tray with soil and add your plants. Water the plants well and allow them to sit for half an hour, then pour off any excess water that they didn’t drink up. Place the planted tray inside the terrarium. Now add your decorative elements. Try placing pretty stones, moss in different colors, and bark with interesting textures into the terrarium. Move them around until you get a design that you like. One of my favorite decorations for terrariums is DIY clay mushrooms. I’ll be posting a tutorial on how to make those soon, so keep an eye out for that. I also like to add some magic with waterproof LED fairy lights. These are battery operated and made to go inside terrariums. 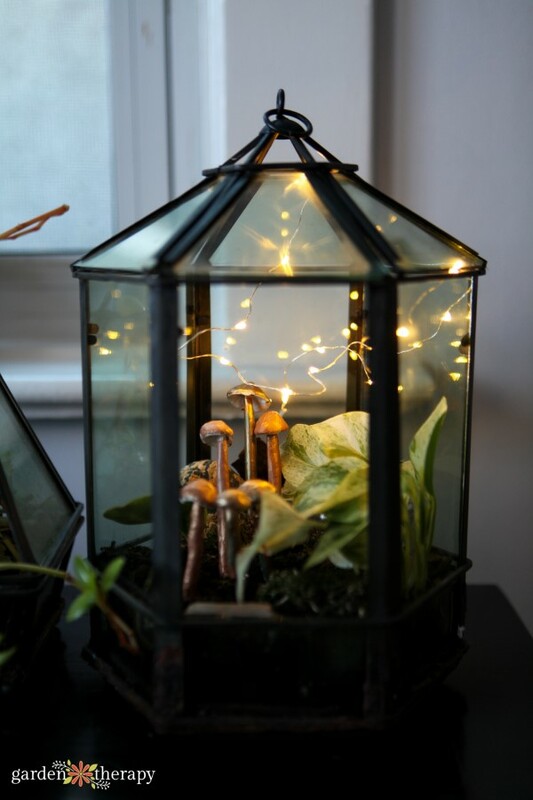 They add just that little bit of magic that makes a terrarium its own special little world. For the most part, terrariums don’t require fertilizing because you actually don’t want the plants to grow large very fast and outgrow their small environment. However, if plants are looking weak, you can add a diluted indoor plant food formula to give them a little boost. 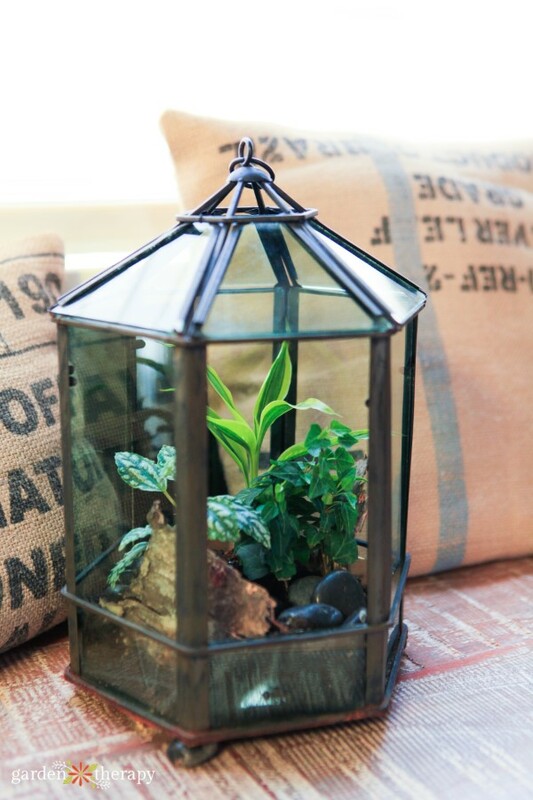 In a covered terrarium like this that produces a ton of humidity, you don’t need to water much at all. 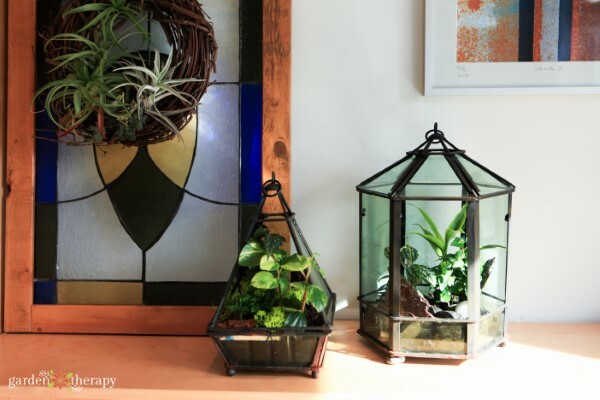 Simply water lightly every few months and otherwise let the terrarium do the work for you. Have an Overgrown or Dying Terrarium? 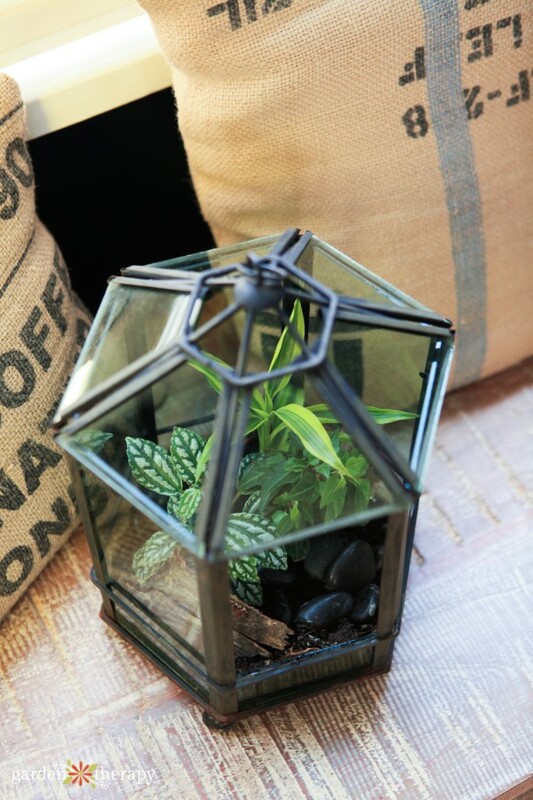 Get Creative with a Terrarium Makeover!